OK, so you now have a digital workplace strategy showing the direction you need to move in; a governance framwework to show who is responsible for what with standards, etc, to give you a fantastic online experience; policies and values that encourage you to use a digital workplace and benefit from them. It is critical that the time you use in a digital workplace is not wasted. That means having clearly labeled information, direct route to the information, able to use the information whatever device (laptop, tablet, smartphone) you have, and be able to edit the information as well as read it. And it’s not just information, you need to find people who can help you or you want to share some knowledge with. Having an easy to use people finder helps as well as finding collaborative content in discussion groups with other people with similar needs or interest. Finally if you are mobile your time is limited. You need fast access to apps and services you need to use e.g. booking travel, hotel room, invites for meetings, hire care. The list is long but you need to get to each task in a short time and complete each task quickly. You need to have the right tools and access to gain the full benefits from a digital workplace. Your organisation needs to fund and provide laptops, smartphones, tablets as well as an internet connection and monitor screens for homeworking. Having the right choice of devices means you can always use the digital workplace whenever you need to – checking people finder, completing tasks, sharing information. This means you can be more productive and aim for a better work/life balance. No more waiting to get to an office before you can do your work. And with the right device you can do your work better, maybe faster too. You need reliable access to your digital workplace when you need it. If your organisation gets it wrong then you probably won’t use the digital workplace so much. Your IT network needs to be reliable for speed and availability. If it is frequently down for a hour or so you won’t trust it and become reluctant to use it. If it is slow then you will vote with your feet and stay in a physical office where you can contact people and work better. You must be confident you have secure access to your digital workplace. Your organisation needs to be confident it will not be abused by anyone away from their physical workplaces. For example if you want to check your pay record online you want 100% confidence only you can do this. Likewise if you need to access sensitive information online the organisation also needs 100% reassurance only those with the right permissions, like you, can use it. To be fully productive you need to use these services with confidence about how secure they are in a digital workplace. What applications do you need for your work? What collaborative tools do you to share? Will any device work in your digital workplace? All of these need to be addressed before you need them. It may take your organisation time, effort, and money to research fully what is needed. However it will be seen as an investment in the months afterwards when you start using your digital workplace because it helps you to be more productive. Please contact me if you need my help or leave a comment on this post. My next post will cover how the weather can help your digital workplace. 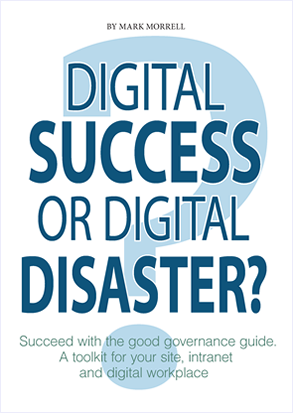 What is the right governance model for a digital workplace? Thank you to everyone who read my last post ‘What is a digital workplace?‘ and contributed to a great discussion helping to define it. Staying with the digital workplace theme I want to show you the views given in my workshop at IntraTeam 2012 event ‘How to build the right governance model for the digital workplace‘ which produced some great responses. Who should be responsible for developing and implementing the digital workplace strategy? Digital workplace principles need to be put into your own organisational context. A board of representatives from across the organisation is needed to coordinate a digital workplace strategy. This board can have decision or advisory status. Alternatively you could have a central business unit responsible for strategy, processes, planning and implementation. While there was no clear decision on who led the digital board or business unit there was a consensus it was NOT to be anyone from Communications! What should everyone expect or need when using a digital workplace? Everyone should gain a better work/life balance from a digital workplace although managers and their team members will have different expectations. The digital workplace should have all the information and tools you need integrated, easy to access and to find. You are able to connect from any device you have. How do employees gain confidence with the digital workplace? Please help me and the other intranet professionals at the workshop by commenting on the outcomes.